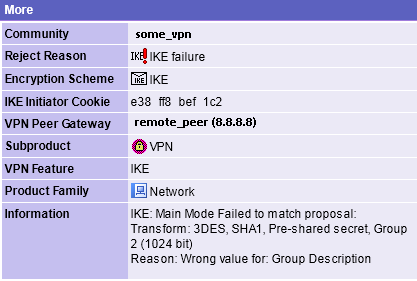 This error means that you have a mismatch in Phase 1 settings on the other side of the VPN. “Group Description” should not confuse you – mismatch is not necessarily in Diffie–Hellman group value. If you have access to the remote device, check the settings yourself, or contact its maintainer.